Of these, four were reportedly criminal cases, while the rest received administrative sanctions. The most recent case was discovered on February 13. Forest rangers in K’bang District’s Son Lang Commune seized 22.5cu.m of timber, a saw and a farm truck which illegal loggers used to cut and collect timber. Violators had been using excavators to enlarge the road to transport timber by tractors and barges for a long time, but local authorities failed to detect the crime. A group of reporters from Quan Doi Nhan Dan (People’s Army) newspaper recently visited the destroyed forest areas and found wood-gathering yards in the districts of Chu Pah, Dak Doa, Kbang and Ia Grai, with hundreds of trees chopped illegally. On January 3, the reporters found a timber-gathering yard in Ia Grai District’s Ia Kha Commune. They saw tens of cut trees floating on the water of Se San 3A hydropower reservoir. Many of the trees, 40-80cm in diameter and 4-5m in length, were hidden in the river. Ro Cham Bung, a resident of Chu Pah, said his house was about 500m from a timber-gathering yard. Therefore, he often witnessed the transportation and trading of timber here. Local people reported the violations to competent agencies but they persisted. Authorities have even been threatened by timber traders, he said. According to Nguyen, local people’s demand for wood increased in the first two months of the year near the New Year holiday, resulting in larger imports of timber from Cambodia to Gia Lai. 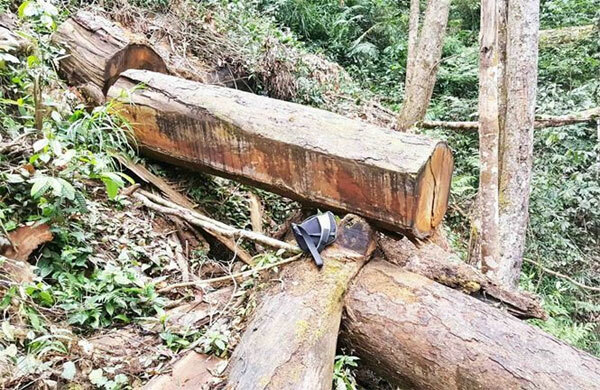 Local rangers also issued fines for many administrative cases of hiding and selling small quantities of products made of natural timber such as statues and tables. That was the reason for the sharp increase in forest related violations in the first two months in the province, Nguyen told VNA. He acknowledged that local forest rangers lacked skills in forest management. Illegal loggers easily escaped from the powerless forest protectors. The division would review the work of the individuals responsible for local forest protection at stations in the recent cases of deforestation, he said. He also admitted that rangers faced problems due to a lack of adequate human resources. At present, each ranger must look after more than 10,000ha of forest area. Working conditions are tough. Many places lack access to telephone networks, causing interruptions in case of emergencies. The forest rangers in the locality said the struggle with illegal loggers involves bloodshed. The illegal loggers are so aggressive that they are willing to attack the police to rescue accomplices. To prevent deforestation, local authorities have prepared many plans for forest protection and have raised public awareness on the forest protection law. “The local government has been asked to closely co-ordinate with rangers to prevent deforestation, while people have been encouraged to report deforestation cases to competent agencies,” Nguyen said. He added that the province would severely punish officials who do not detect offences, do not stop violators in time or lend a hand to illegal loggers and shirk responsibility for protecting forests. In 2017, there were 798 cases of deforestation. Of these, 24 were reportedly criminal cases, while the rest received administrative sanctions.